CHICAGO -- A man killed by Chicago police had a gun in a holster at his hip and was shot multiple times as he ran away, spun around and reached toward his waist, according to footage released Sunday from an officer's body-worn camera. Police Superintendent Eddie Johnson said it's the quickest he has ever ordered such video released and that he hoped to dispel rumors that Harith Augustus, 37, was unarmed. He also hoped that making the 30-second clip public before a planned protest would prevent another violent confrontation between residents and officers. The short video appears to show a gun tucked into Augustus' waistband but it is unclear if and how much the video is edited at all. Protesters angry about the killing Saturday took to the streets in a city that's struggled with police shootings, especially against black men and other minorities. Some threw rocks and bottles at officers -- including ones filled with urine -- and police pulled people to the ground and hit them with batons. "The community needs some answers and they need them now," he told reporters Sunday. "We can't have another night like last night." The video, which lacks sound, shows four officers approaching Augustus outside a store on the city's South Side. An officer points to Augustus' waist and he backs away. Three officers try to grab his arms and he tries to get away, backing into a police cruiser as his shirt flies up and shows the gun. The footage pauses and zooms in on the weapon, which police spokesman Anthony Guglielmi said was done to ensure a semi-automatic handgun in its holster and two bullet magazines tucked into Augustus' waist could be seen clearly. Augustus did not fire his weapon and the footage does not show him pulling the gun out of its holster, though he does appear to try to grab something at his waist, Guglielmi said. Police also released a 50-second slow-motion clip showing Augustus reaching toward his waist. It's not clear if he was going for the weapon. Augustus died of multiple gunshots wounds, medical examiners said. He wasn't a known gang member and had no recent arrest history, Guglielmi said. Johnson said Augustus had a valid firearm owners' identification card but detectives have found no documentation that he had a permit to carry a concealed weapon. A resident of the area, Gloria Rainge, told the Chicago Sun-Times that Augustus, known in the Grand Crossing neighborhood as "Snoop," worked at a barbershop and had a 5-year-old daughter. The Rev. Jesse Jackson called the shooting a tragedy and said in a statement that it's a blessing Augustus didn't bring the girl with him Saturday, as he's known to do. Officers patrolling on foot tried to question the man over a "bulge around his waistband" that suggested he was armed, patrol chief Fred Waller has told reporters. 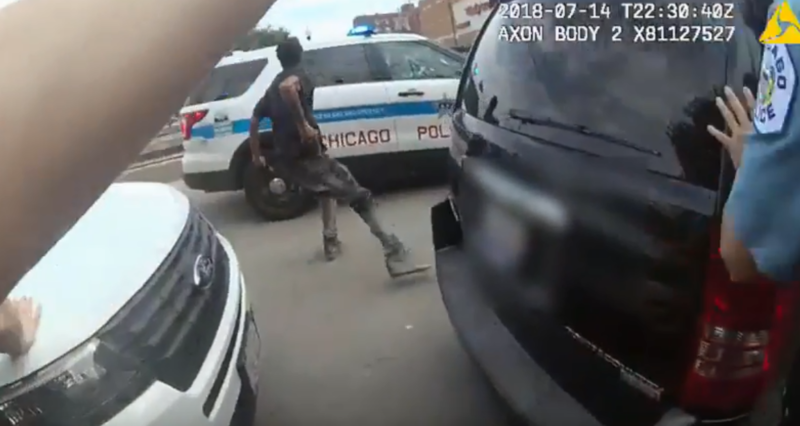 The Civilian Office of Police Accountability, which investigates officer-involved shootings, said it was analyzing the video and asking anyone who may have captured cellphone footage to share it with the agency. After the shooting on Saturday evening, tensions rose quickly, CBS Chicago reported. Dozens of people showed up, and at some point the officers had to push the crowd back. Within hours of Calloway's news conference, police released the video.